How do you take your Maserati for a drive down a European cobblestone street when you live in Maryland? You put the cobblestone street in your own garage. 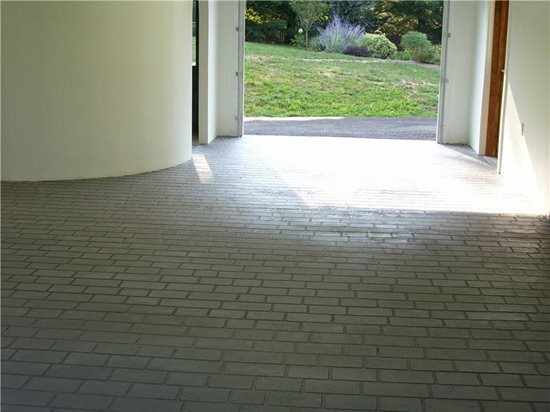 "I was contacted by a homeowner who was a car enthusiast and wanted to create the look of a cobblestone road in his garage," explains Dan Mahlmann, owner of Decorative Concrete of Maryland. Being a car enthusiast himself, Mahlmann liked the idea and the creativity and enthusiasm the client had for the project. 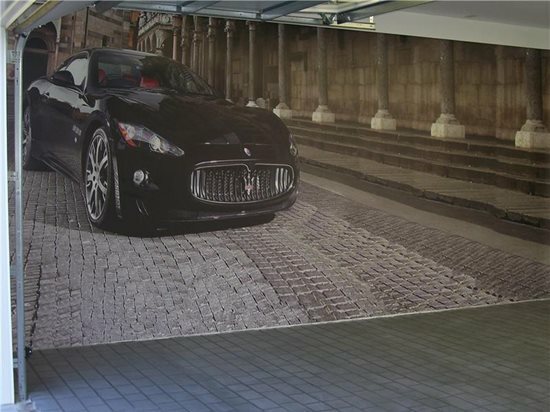 On the inside wall of the garage, the homeowner had enlarged an image of a Maserati parked on an old cobblestone street. "He owns the Maserati in the image," says Mahlmann, "so he wanted to have a European cobble road spring to life in his newly built stand-alone garage. He wanted to feel like he was on a European cobble road when he walked in." The wall image came from a magazine picture the homeowner had found. "He had to have it photoshopped and tweaked to get it that large," recalls Mahlmann. "He had a vision of having the floor come out for a 3-D effect." After discussing the best method to get the cobblestone effect, whether it be hand-applied taping or a cobblestone stencil, the decision was made to use a stencil. "We visited Concrete Texturing Tool & Supply in Throop, PA, and we decided on a pattern from DCI stencils," says Mahlmann. Next, Mahlmann did a sample of the coloring, and the plan was in place for the floor. Mahlmann started with grinding the floor, then applied a bond coat of Elite Crete's Thin Finish. He then applied the base coat (also Elite Crete Thin Finish) with Pure Texture's pigment grout line gray color. The stencil was then put in place and a lock down coat of Elite Crete's Thin Finish was put down to prevent any bleed through under the stencil pattern. Once the stencil was locked under the overlay, a texture coat with Pure Texture color blue stone was troweled down with another layer of Elite Crete's Thin Finish. The stencil was then pulled up and Elite Crete's CSS sealer was applied. The result? 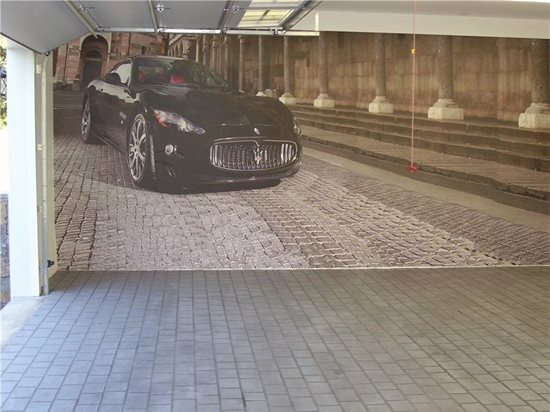 A custom, one-of-a-kind cobblestone garage that the homeowner loves and which he is submitting to Architectural Digest for a worldwide garage floor contest.